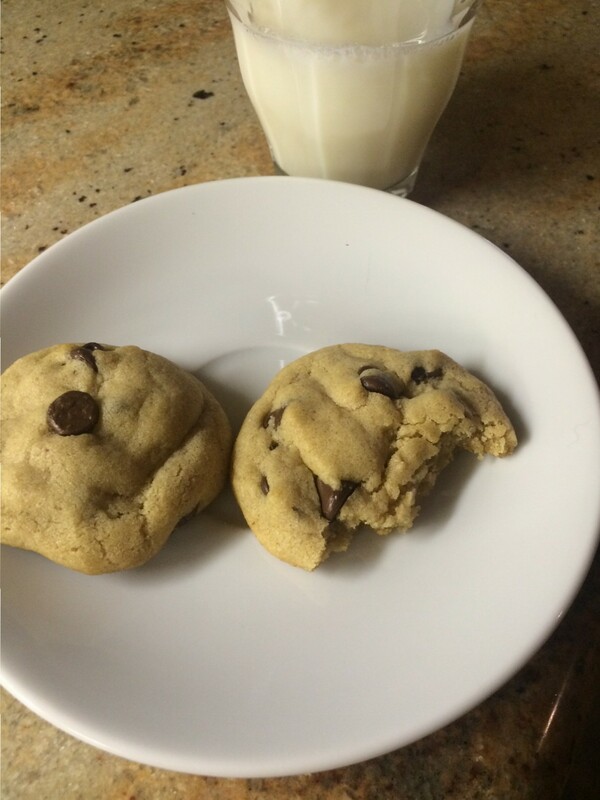 I have so many fond memories of helping my mom bake chocolate chip cookies when I was growing up. 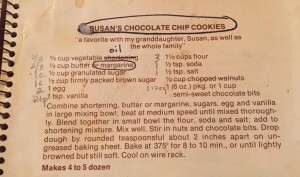 She made chocolate chip cookies so often that she actually had the recipe memorized and she let my brothers and me taste the dough at every step of the baking process, culminating in the licking of the beaters. We Disharoons are definitely purists when it comes to our chocolate chip cookies: we wouldn’t dare add oats, nuts, or (God forbid) raisins. And now that I’m an adult, this is still my go-to chocolate chip cookie recipe, and they are always a crowd-pleaser; they are chewy and delicious, and they go great with an ice-cold glass of milk. 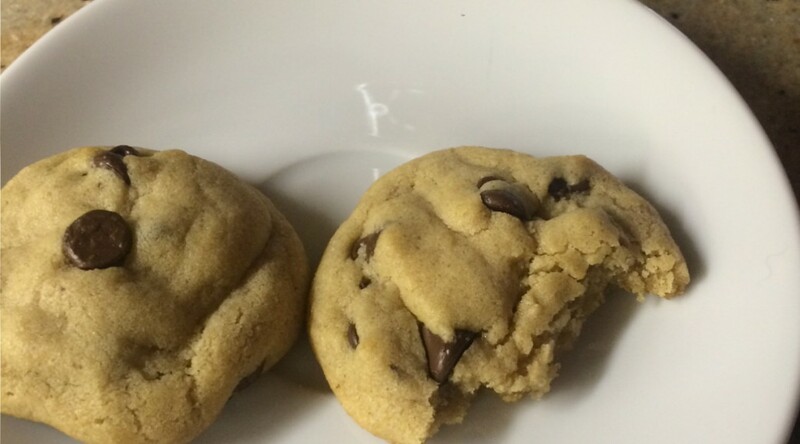 The one trick I have to making the perfect ooey gooey chocolate chip cookie: put a dial thermometer inside your oven (about $5) to ensure it’s at the right temperature, then cook for exactly 8 minutes. 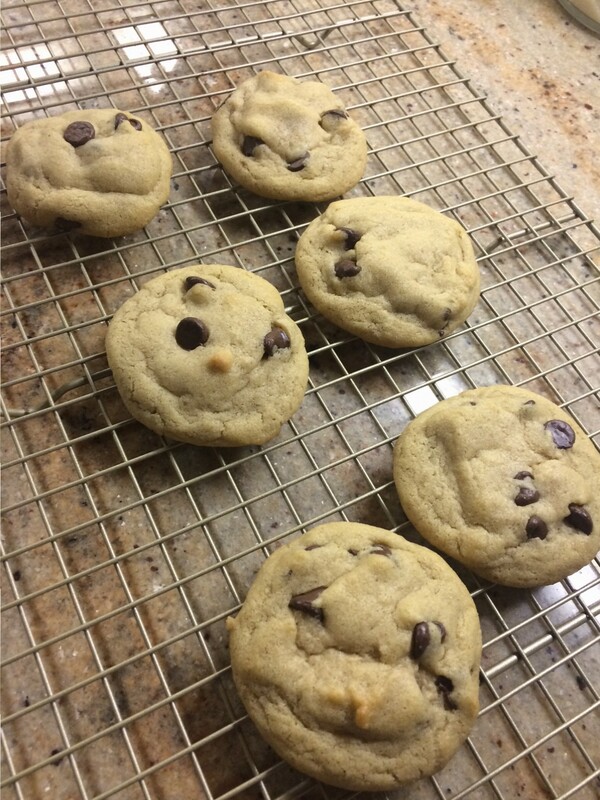 They may still look a tad undercooked when you first pull them from the oven, but I promise they will be perfect every time (assuming you are not cooking at high altitudes). This recipe is adapted from my mom’s 1977 copy of the Miriam B. Loo’s Family Favorites Cookbook designed by Linda K. Powell. 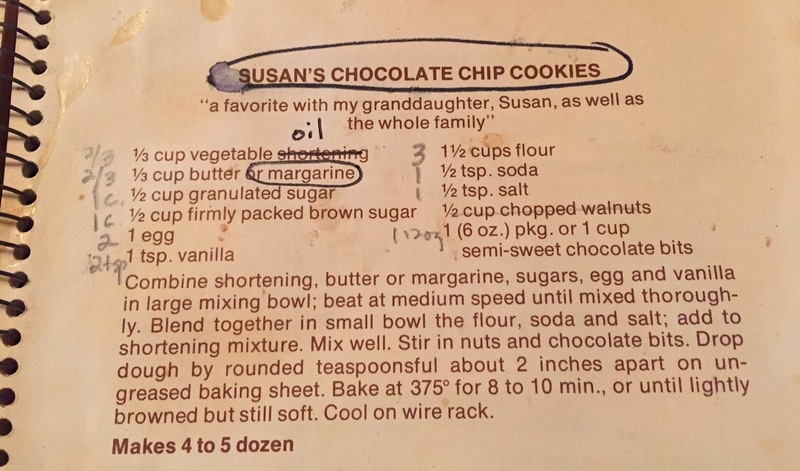 The recipe is called “Susan’s Chocolate Chip Cookies” which is fitting because when I was in high school, many of my close girlfriends thought my mom looked like Susan Sarandon, so they chose to call her “Susan” instead of her real name, Mary. As you can imagine, this was very confusing for the other moms, who simply assumed this generationally appropriate name was my mom’s real name until she corrected them. All of the above ingredients should be at room temperature before mixing. Preheat oven to 375° (check dial thermometer to ensure your oven actually reaches this exact temperature). Cream together the oil, butter, and sugars in a large mixing bowl or KitchenAid mixer. Add the egg and vanilla and beat at medium speed until mixed thoroughly. In a small bowl, mix together the flour, baking soda, and salt; slowly add to the sugar mixture. Mix well. Stir in chocolate chips. Drop tablespoon-sized balls of dough onto a greased baking sheet, about two inches apart. Bake for 8-10 minutes, or until lightly browned but still soft (8 minutes always works perfectly for me). Cool on a wire rack. Makes about two dozen.